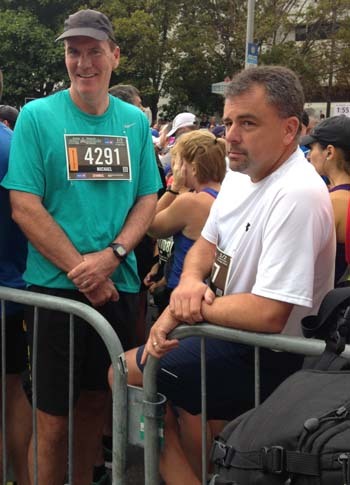 When Master Corp. Wally Rau crossed the finish line Sunday at the Canada Army Run, the aviation technician broke into tears. Rae suffers from PTSD after a rocket landed 100 metres away from him, and he was forced to help with repatriation ceremonies for more than 40 soldiers during a two-year period. Rau joined 13,000 others who walked or ran the five-kilometre route to raise money for Soldier On and the Military Families Fund to support ill and injured soldiers. Rau himself has benefited from the services of Soldier On since he realized his time in Afghanistan had deeply affected him. In 2010, Rae was diagnosed with PTSD. Maj. Jay Feyko, the lead officer for Soldier On, ran the five-kilometre race with his wife, Tory Feyko. He was injured in Afghanistan in 2004 when a suicide bomb detonated close to his patrol. Corp. Jamie Murphy was killed in the attack and three others were injured, including Feyko who suffered shrapnel wounds and became blind in one eye. Feyko said it was humbling to see the amount of people who lined the streets or participated in the race to support Soldier On. “For us, it’s just inspiring and motivating ill and injured members to take up something and do something,” Feyko said. In total, 25,000 people took part by running, walking or rolling through the five-kilometre and half-marathon races. The number of participants has more than doubled since the first run in 2008, which saw 11,000 people turn out to raise money. The five-kilometre and half-marathon routes were lined with supporters cheering on the participants. Cathy Anderson cheered on Robert Wein, who was one of five cyclists injured on July 19, 2009 when a car crashed into them on March Road. Wein, who was left with brain damage from the crash, had a simple message about the race. Joey Desjardins, the winner of the ambulatory half marathon, suffered a spinal-cord injury that left him a paraplegic in a motocross crash in 2009. Since then, Desjardins has become an advocate to hand cycling, which is how he made it to the finish line in 41 minutes. Although he came first, he didn’t receive a medal. The Army Run board of directors voted to discontinue medals for the winners in the ambulatory category. “(The race) shows everyone how we can overcome the challenges in our lives, but you’re not doing anything for the people that are overcoming those challenges,” he said. Maj. Gus Gerant, the race director, said ill and injured civilian and military members approached the Army Run to ask them to discontinue the medal. The medals for the racers in the non-ambulatory five-kilometre and half-marathon categories were still handed out on Sunday. Maxime Leboeuf was given a medal for first place finish in the army run half marathon. He said he welcomed the downpour Sunday as he crossed the finish line. The 27-year-old worried that the runner 100 metres behind him was going to catch up. Instead of cruising to the end, Leboeuf sped up to a sprint. As soon as he crossed the finish line, Leboeuf ran to his girlfriend to give her a kiss through the fence that surrounded the area. By Sunday afternoon, $350,000 had been raised but pledges were still coming in. The Canada Army Run has donated more than $800,000 to these two charities over the last six years. For the first time Louis and I took part in the Army Run which took place in Ottawa on Sunday.It was a well organized and inspirational event.We, along with our daughter Jenn and my new running friends Karen K and Susan N from Lively, attended the Pasta dinner on Saturday evening.There were a number of speakers but John Stanton and “Man in Motion” Rick Hansen were our favourites. Neither one of them could thank the troops enough for what they are doing/have done for Canada and to all the participants for supporting the troops. John reminded us of how proud we would feel to be a Canadian when O Canada was sung at the opening ceremonies in the morning. Boy was he right! Rick Hansen’s talk was so inspirational speaking of adversities and challenges that face our soldiers .He spoke briefly about his own experience. Thank you Sudbury! You raised more than $7,000 at the 2014 Brain Tumour Walk to transform the future for brain tumour patients and survivors. Thank you. in Mattawa,ON called "Off The Grid" at Natures Harmony lodge and I have been doing it ever since. a swamp crossing plus countless mud holes along the way. Jen and Tzaike race directors and all the volunteers continue doing such a great job putting on this event. The hot eco showers and sauna waiting for you at the finish line area are a real bonus. A delicious catered buffet of lentils, beans, pasta, salads and desserts are also provided to runners post race. medal, I am also offered an ice cold steam whistle...what a treat...chocolate milk was also offered as an option. This is truly one of my favourites and I look forward to coming back next year. The Sudbury Fitness Challenge is a series of six athletic events that take place each year in the City of Greater Sudbury area. The Challenge consists of the following events: Sofie Manarin Nickel Loppet, SudburyRocks!!! Race, Run or Walk for Diabetes, Canoe Marathon, Ian McCloy Island Swim, Beaton Classic and Youth Triathlon, and the Walden Turkey Gobbler and Nature Walk. These events are offered to promote the value of an active and healthy lifestyle through participation in physical activity. Don't get left behind! 5 events are already complete. But there is still one chance to challenge your friends and rivals in the quest to become Mr. or Ms. Fit. There are youth categories, overall categories and age group categories. at the Turkey Gobbler Trail Run! 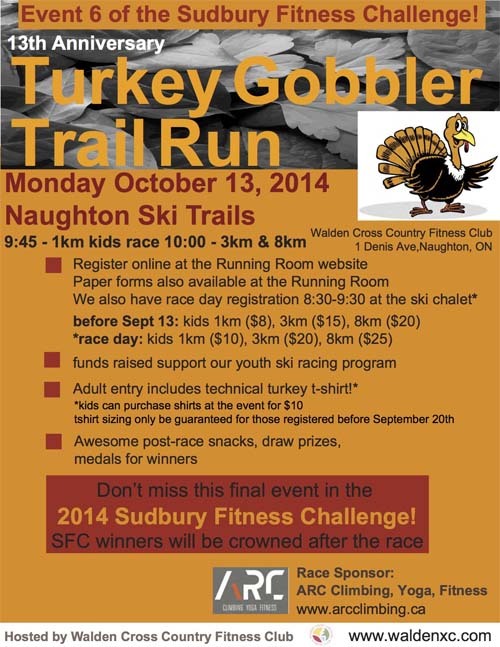 The Turkey Gobbler Trail Run is the last event in the 2014 Sudbury Fitness Challenge, held on Thanksgiving Monday – October 13. This run is a family-friendly fundraiser for the Walden Nordic Ski Club youth racing program. Held on the Walden Cross Country Fitness Club Ski Trails in Naughton, the run includes a 1k kids race, 3k race and challenging 8k distance. Sudbury Rocks!! members and race coordinators Neil Phipps, Rob Marcolini and Sara McIlraith desperately need at least 10 volunteers for race marshaling and start/finish line support. Volunteers receive a technical Turkey Gobbler race shirt, and great snacks for helping. Volunteers are needed from 9 to 12. If you can help, please email Sara at saramcilraith@sympatico.ca. 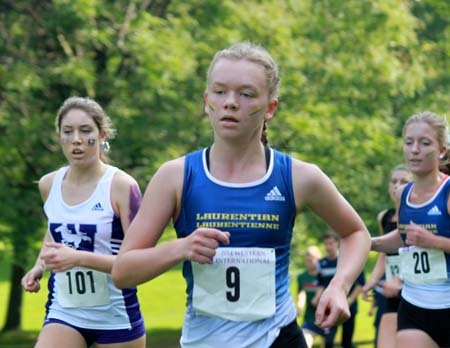 The Laurentian women’s cross-country running team competed at the Western International, in London, this weekend, finishing with a best-ever 4th place finish for the event. The race involved 111 runners from 12 teams from Ontario, Quebec and Indiana. Led by second year runner, Emily Marcolini (Sudbury), the Vees finished with a school record 124 points on the course, only 3 points behind 3rd place McMaster. It was an improvement over their 7th place 187-point finish of last year. 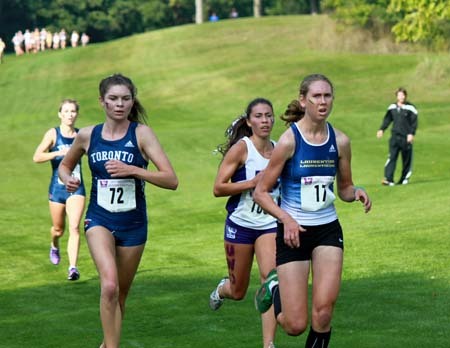 Aside from Marcolini, the Vees placed five scoring runners in the top-30, including Katie Wismer (Sudbury) in 19th, Michelle Kennedy (London) in 26th, Samantha Edwards (Toronto) in 28th and rookie Maddy Bak (Guelph) in 30th. Laurentian’s top-five scoring runners finished only 26 seconds and 17 places apart, an excellent grouping in a sport in which only the top-five runners from each team score points. Laurentian’s next race is next Saturday at the Harry Anderson Invitational, in Rochester, NY.